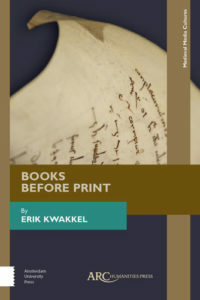 Manuscript expert and book historian Erik Kwakkel has written Books before print as a handbook for students in their lectures on medieval books. The study of medieval book culture has been on the rise in recent years. Apart from academia, the study of medieval and early modern manuscript and book culture is also gaining popularity outside the world of professional researchers. For some years now, in various academic History courses at home and abroad specializing in book history is possible. As a lecturer at several of these programs, Kwakkel lacked a concise manual that could serve as an introduction to this branch of historical science. That is why he decided to write such a publication himself. The result has become Books before print, a survey that deals with many, many facets of the study of manuscripts and book culture, specifically but not exclusively aimed at the Middle Ages. The book is divided into five parts, where first the production of the book itself is discussed, and afterwards also the reading and book culture of the Middle Ages are investigated. After all, that is what the books were part of. When studying a medieval manuscript you have to deal with many difficulties, the script type itself is already a challenge to decipher, but it can also tell you a lot about the period in which the text to be researched was written. Furthermore, frequent use was made of abbreviations, which you also have to solve if you want to understand the text. Paleography is therefore an indispensable element in the study of medieval books. However, research into manuscripts goes beyond merely deciphering the textual message. The material used, decorations that are present, the structure of a book and available margins and notes can all tell the researcher something about the function that the book, or the surviving fragment, once had. Given the fact that the books are all hundreds of years old and have lived many lives, it is sometimes possible to find out what the book has been through over the centuries, by means of annotations in the margins or scribbles in the front and back of the book. The chapters on reading culture form an interesting counterpart to the chapters that focus on the individual book or even the individual sheet of parchment. Kwakkel explains how different genres of books were used, how this choice of genre had an impact on the form and production of the works, and how this can help the researcher to place his object of study in a historical context. In medieval textbooks, for example, a lot of empty space was left in the margins to allow notes to be recorded, and religious works used in mass included relatively many subheadings, distinctive use of colour in inks and a relatively large easy-to-read letter. Also very interesting are the sections on reading aids, where the various types of bookmarkers that were used are discussed, and of course the maniculae (singular: manicula), the pointing figures, often hands, on the margins of the text that draw the reader’s attention to an important section. In the Netherlands you can still see them in street nowadays, at traffic lights for cyclists. It is interesting that although the form of certain ways of book use has changed over the centuries, the essence has often remained the same, for example in the case of maniculae, although nowadays we use arrows instead of tiny hands. This lasting insight, together with the wealth of information about medieval book culture and book production and the many beautiful illustrations, is the greatest recommendation to read this publication. Every archivist and historian can take advantage of it.